I was wondering this - for anyone who has visited - is there the physical possibility of renovating it to match the TV interior layout downstairs? Well, they didn't even bother doing that for the 2012 TNT reboot, so it's hard to imagine they'd go to the expense of gutting the interiors to match fans' anticipation of what it ought to look like some 26 years after the original series ended. What I meant was, if the owner wanted to replicate the TV interior, could that be done with the real Southfork, or would it not be possible structurally? I just can't imagine why a multi millionaire would buy it and not considering doing that, especially as the current owners have taken to using the ranch as a sightseeing/event venue. And yes, that's a nice video, thank you. I agree. It's been spoken of in another post. I've seen images of the interior and it looks tacky, over the top, especially the bedrooms. I live in Australia and as much as I've always wished to visit the ranch I'd have no desire to walk inside. I would enjoy the exterior but if I was to visit I'd want the whole experience. Walking from that dining room, past the famous staircase and into the living room would give a real sense of how the Ewing family lived. The house itself (when viewed from the front) lends itself to replicate the interior rooms of 4800 Park Lane. Besides, any interior house can be gutted to do what you wish. As for the current owners of one of the most famous buildings in the world, I'm sure they saw their visitor numbers go up a notch after TNT Dallas aired, it would be proactive to replicate what we saw in Lorimar Dallas. They don't need to remodel the upstairs, just those important rooms downstairs would suffice. It could be done easily with the downstairs -- it's big enough .... well, it's long enough anyway (the study/den behind the living room couldn't be as deep as the one on the first few seasons of the show -- even if you constructed the living room at about 17 x 34 feet, that would only leave 8 or 9 feet at the most for the depth of the den, which looks to be roughly 15 feet deep on the show). But otherwise, everything could fit. Upstairs, no way. 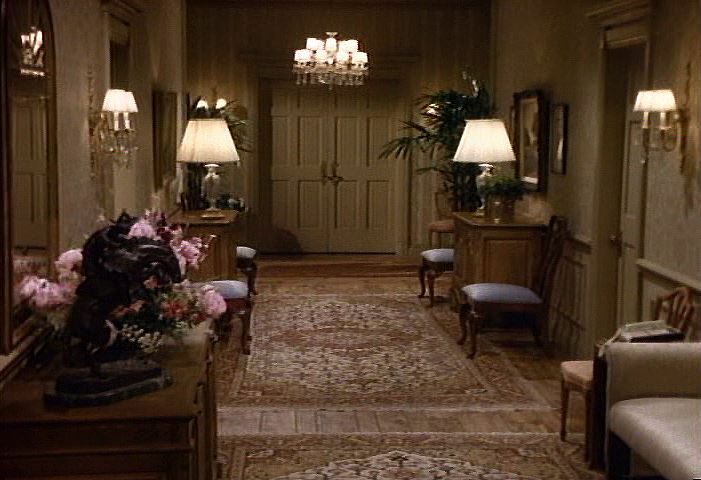 The middle section of the upstairs interior on the show appears to be roughly 60 or 65 feet (Miss Ellie's room, the cross hall, the guest room Jenna stayed in, JR's bath and his bedroom...) but the real house is only about 45 feet deep there maximum.... I mean, I guess they could do it, but they have to leave out Jenna's room, John Ross' room, while Miss Ellie's room would have to be scaled down to about 10' in depth (roughly half of what it was). And who knows where you'd place the architecturally mysterious kitchen? -- perhaps you'd put it where they've got Miss Ellie's rose bedroom downstairs. Not that's I've given this any thought. Because that would be pathetic. My point though was that the show is now too old for people to care, in all likelihood. If they'd done it years ago, then maybe. Well if I ever win the lottery on a rollover week I'd buy it and do the downstairs re-design - hell, the upstairs too if it were possible with part rebuild. That said, with all the huge metallic barns around the place, just replicating all the sets of the house, Ewing Oil offices and possibly Cliff's house would be a good alternative option. But I need that winning ticket first. The Study/Den wouldn't bother me as much, not seeing it that is. Apologies for repeating myself but it would be a blast to see the floor layout just as we watched on Lorimar Dallas. I do like your idea of replicating the sets on the ranch. It would be a cheaper alternative than submitting all those plans for approval from the relevant governing bodies to renovate the house itself. I've always promised myself if I one a huge lottery I would replicate Southfork, and I would use the lower interior floor plan of 4800 Park Lane. it's hard to believe they removed the paneling in the living room! I live in Australia and as much as I've always wished to visit the ranch I'd have no desire to walk inside. I would enjoy the exterior but if I was to visit I'd want the whole experience. I live in the U.S., and travel through Texas quite often. It does seem like some of the senior members here at SoapChat have been through Southfork and had a great time, and I'm really glad for that. CAUTION: Some people, including me, left feeling let down. When you watch the show you see all the characters coming and going. You see the cars out front, and Theresa serving breakfast. When I toured Southfork, it just wasn't the same without Ray out there fixing the fence. It just wasn't the same without Jock's car in the driveway. It just wasn't the same without Harv Smithfield coming in to deliver some news. So I hope you have a great time, as many people on here did. But prepare yourself for the fact that it just isn't the same without the people there. ... and that the house is the size of a Hyundai. and that the house is the size of a Hyundai. The magic of television. I have been warned from those that have visited Southfork to prepare yourself how small it is. Still, to me it exudes grandeur and warmth, which is weird considering it's not your typical mansion type. I'll take Southfork any day compared to that stuffy house the Carrington family resided in. Like the family that house left me feeling cold. Perhaps that was the idea. Yes, the Carrington's mansion was pretty horrible, kind of like a mausoleum -- not the actual Filoli estate, however, which is apparently quite lovely, but the soulless, colorless Hollywood reproduction of it. Apart from the lily pond catfight between Alexis and Krystle I don't recall seeing much of the external Filoli Estate being used in Dynasty. This was a key point of difference between Dallas and Dynasty. Though I'll admit I hated the replica Southfork at Hollywood. Honestly I don't know if it's possible since when I visited Southfork back in 2008 I didn't even look at all the interiors. I just passed through the house like real quick. But if it's possible to redo the house to make it look more like on the show I think it's a good idea. As it is now the house doesn't really look anything like the show. But I guess it's up to the owners really. 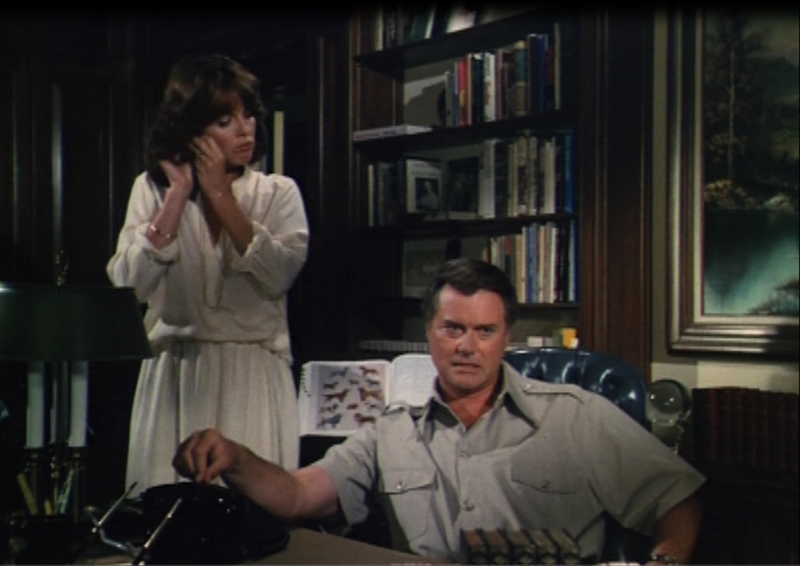 What I also wish they'd remove is "the room where JR was killed" (Which used to be Miss Ellie's bedroom) since honestly most Dallas fans doesn't want to be reminded of that JR was killed in some stinking hotel in Mexico. I think the whole idea of that room is tacky. The graveyard is a nicer touch though, so that they can keep. I agree 100%. How could the owners of Southfork honestly believe that would be something tourists would like to see. Please tell me they didn't have tape on the floor outlining JR's body? Like the family that house left me feeling cold. Perhaps that was the idea. Yes, I think, in some way, the house was an antagonist. It's an interesting way of looking at it and a point of difference to Dallas, if only it was exploited. Southfork was more open due to it being a working ranch. Despite the Carrington mansion being huge - God knows how many rooms were there - it had a very claustrophobic feel to it. It has been years since I've watched Dynasty Season 1 but didn't they ever use the coldness of the mansion and somehow reflect that on Krystle? Yes, they only shot at Filoli for the pilot. From that point forward, they only used it for establishing shots before a scene.